Over the past two hundred years, several have ventured to write a history of Jesus, but few have discussed their method of writing about the past with any depth. Unspoken assumptions or bias often dictate what the historian will find. The fact that there are so many conflicting pictures of Jesus compounds the problem. 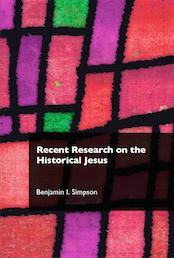 In the last thirty years of Jesus research, which have been identified as the Third Quest for the historical Jesus, historians have agreed that Jesus makes the most sense within a Jewish context, a setting that allows historians to write about Jesus from various historical approaches. Benjamin I. Simpson is Associate Dean and Assistant Professor of New Testament Studies at Dallas Theological Seminary (Houston Campus).